Posted on Saturday, February 28th, 2009 at 8:24 pm. 8:12 pm: On a snowy Illinois evening, two mysterious hooded Asian “thugs” approach Professor Wen. They shoot him at point blank range. He tumbles to the icy ground –setting the on-screen instigating episode that inspires the Hollywood political thriller, Formosa Betrayed. 6:12 pm: The valet pulls our car up to the front of our posh Hollywood hotel, situated next to the famous Kodak Theatre where the Oscars were held a weekend ago. Remembering that a year ago, Slumdog Millionaire, winner of eight Academy Awards, was an unknown film without a distributor puts into perspective where the film Formosa Betrayed is today. Excited, the four of us pile into the car knowing that we are among a privileged group of investors and VIPs who will see a private screening of this long-awaited project. It is also appropriate that the film is debuting on the evening of February 28th, a date that is commemorated by Taiwanese around the world as the beginning of Taiwan’s forty years of martial law. 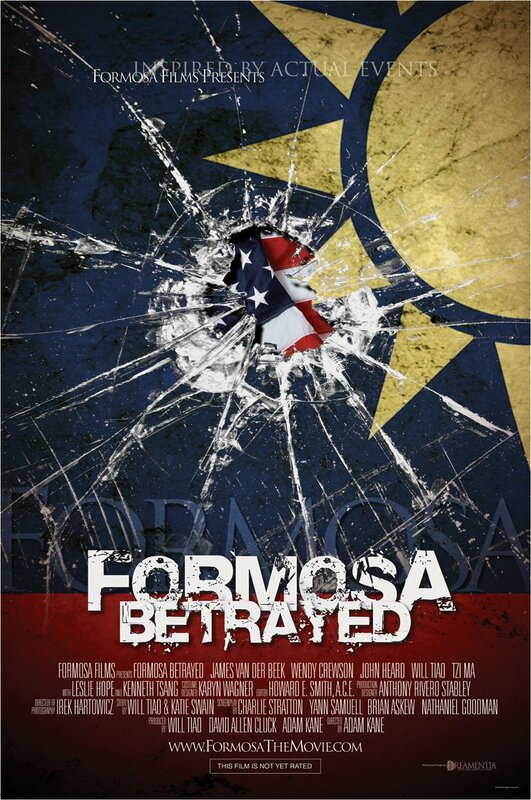 Inspired by actual events, Formosa Betrayed is set in the 1980s and tells the story of an American detective, Jake Kelly, who is assigned to investigate the murder of a Taiwanese American professor who has actively spoken out about the political situation in Taiwan. The incident is reminiscent of the murders of Carnegie-Mellon professor Chen Wen-Chen in 1981 and writer Henry Liu, better known by his pen-name Jiang Nan, who was killed in Daly City, California in 1984. Both were killed, it is rumored, by agents of Taiwan’s government for their outspoken criticism of the political system of martial law-era Taiwan. Setting Formosa Betrayed during this period throws the viewer into the midst of the terror and oppression of 1980s Taiwan, and gives some very important historical perspective on the multinational connections that might have benefited from keeping Taiwan a dictatorship for so long. 6:43 pm. 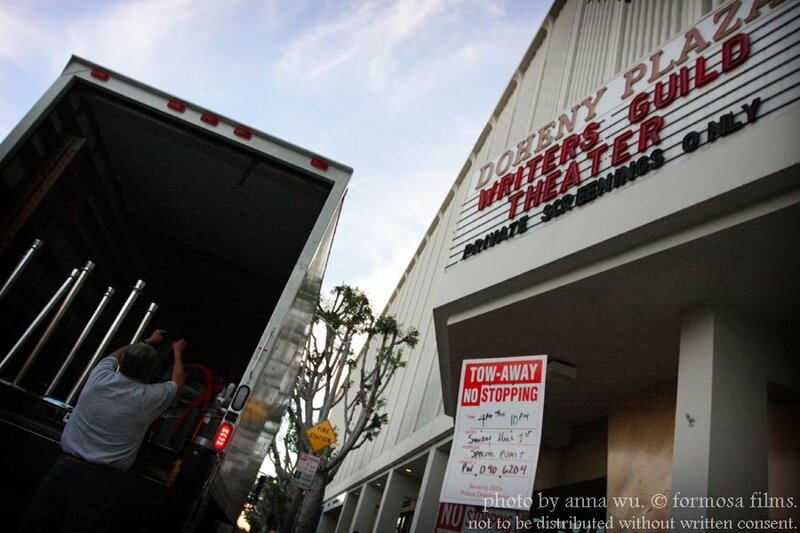 Our car pulls up to the garage of the Writers Guild Association screening studio. We are slightly early. A staff member in a suit leans over to the driver’s window and instructs us to leave all cameras and cell phones in the car before proceeding to the red carpet area. This is evidently the big moment and a well-guarded project.6:50 pm. We join several other Taiwanese Americans who have also arrived early and march up the red carpet. A couple of event photographers are running around, and flash bulbs go off – just a few. There are no movie stars here (yet), just the invited guests who have helped to make this project a reality. Since the early 1970s, Taiwanese have immigrated to the US in mass numbers, many to pursue higher education or better lives for their families. But often left untold is the story of the many Taiwanese pro-democracy activists in America that spent countless years being blacklisted by the government of Taiwan for speaking out about what they believed in. 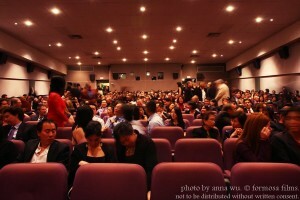 Now, at the premiere of Formosa Betrayed, many of these long-time leaders have begun to arrive. Their bright eyes and vibrant smiles tonight provide a moving counterpoint to the countless years of sacrifice they endured in order to make moments like this possible for younger generations. 6:53 pm. Will Tiao smiles and greets us just inside the lobby as his staff scurries around taking care of last minute preparations. He appears calm and collected, but it’s clear that he must feel as nervous as a groom greeting his future in-laws and 400+ guests at his wedding. This event has been three years in the making. What a journey this has been for actor-turned-producer Will Tiao: TaiwaneseAmerican.org first featured him three years ago during the early fund-raising stages for his independent film project, Formosa Betrayed. 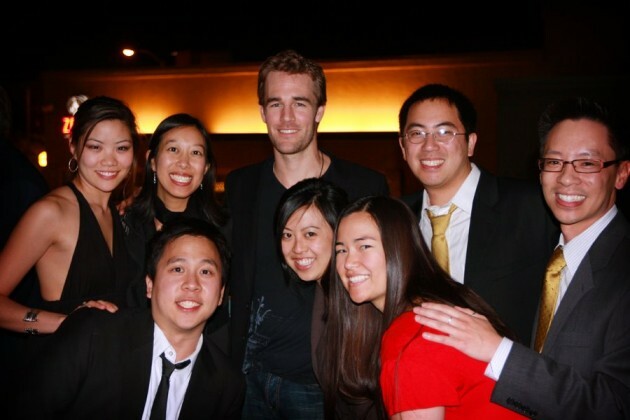 When we met him, he had just raised his first $50,000 after presenting his risky but impassioned ideas about creating a movie that would tell the stories of countless unheard Taiwanese Americans. He might tell you that many doubted that he could bring such an ambitious project to fruition, but after fundraising in 60+ cities and sharing his visions for the film and the impact it would make, investors from all over the world jumped aboard. Now, three years later, Will’s vision has become a reality: an independent film with the scope and production value of a major Hollywood blockbuster. 7:15 pm. Excited greetings and hugs as we find several other 2nd generation friends and fellow investors. The staff announces the theater is now open for seating, and we claim some prime seats just in front of the “reserved” section. No doubt we will be sitting next to some recognizable actors, cast, and crew. Anticipation builds as the theater starts to fill. People crane their necks in search of recognizable faces. When Will Tiao – who, beyond acting and producing the movie, also participated in developing the screenplay – began sharing this compelling story of our untold Taiwanese history around Hollywood, he and co-producer David Allen Cluck attracted a top-notch crew and staff. 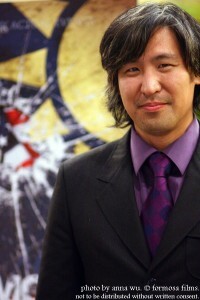 Director/Producer Adam Kane is known for his work on Heroes, as well as the critically acclaimed (but now cancelled)Pushing Daisies. 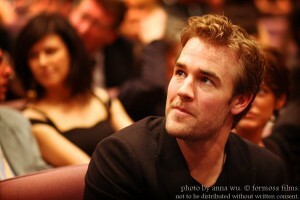 Formosa Betrayed’s actors include James Van Der Beek ofDawson’s Creek fame in the lead role. Solid and talented supporting actors such as Wendy Crewson, John Heard, Tzi Ma, Kenneth Tsang, and Leslie Hope round out the list. The movie was a labor of love: even though the budget of this movie is in the millions of dollars, we hear that just to be a part of this project, most of these actors and crew accepted much less than their normal salary. 7:26 pm. Out in the lobby, a growing crowd buzzes around, greeting each other. 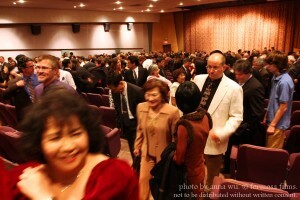 The lobby is a Who’s Who of Taiwanese American community leaders. Virtually every major Taiwanese American organization from coast-to-coast is represented. Speckled amongst the older 1st generation Taiwanese American crowd are many non-Asian faces unknown to us, but clearly these must be Hollywood movers and shakers. From Will Tiao’s early career path as an intern for the Formosa Foundation and his experiences on Capitol Hill working on legislation in the interest of US-Taiwan relations, one would think that this engaging and well-spoken young man had found his place in the world of politics. Washington DC, after all, is the Hollywood of the East Coast; however, Will Tiao started his early college career as a Music major, so it was only natural that he would find his way back into the arts, first as an actor and now as a major player in the world of independent media. His passions – art and politics – seemed destined to fuse. 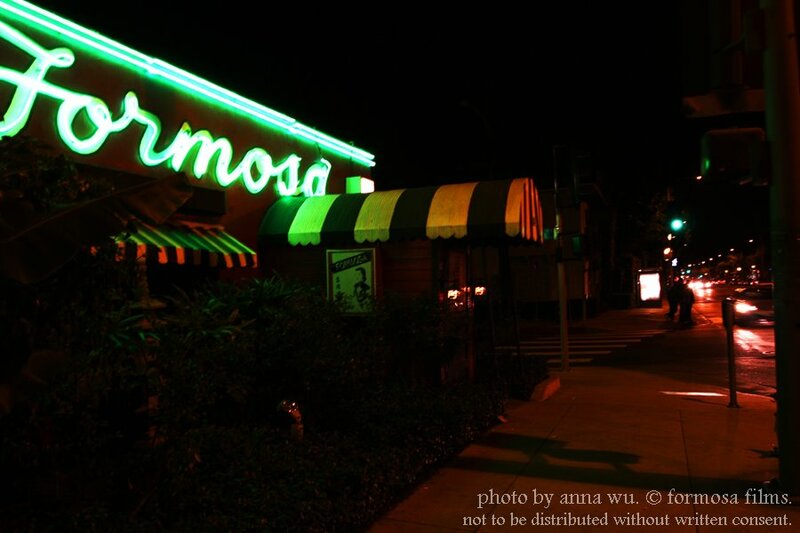 Sure enough, these diverse interests transformed into his first film production company, Formosa Films. Factoring in his talented networking abilities, Will Tiao has the perfect storm of brains, talent, connections and passion needed to pull this project off. 7:33 pm. 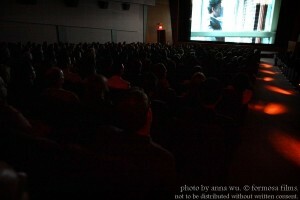 The movie is scheduled to start soon, and the remaining crowds are ushered into the theater. They are slow to enter, but the reason is obvious. The entrance of James Van Der Beek and fellow cast members is drawing everyone’s attention. The actors and production crew stop for red carpet pictures while starstruck onlookers watch. 7:51 pm. Associate producer Jon Lee, fellow 2nd generation Taiwanese American who also serves as a contributor to TaiwaneseAmerican.org, steps up to the front to welcome all and introduce producer/actor Will Tiao and director/producer Adam Kane. Though the movie takes us through the story from the perspective of a white American, several key roles are played by Asian American actors. Tzi Ma, recognizable from his roles in the Rush Hour films and hit TV series 24, plays a deceptively affable official for the Taiwanese government, while Kenneth Tsang plays an army General with ambiguous motives. The multi-talented Will Tiao plays one of the central characters -Ming, an underground democracy activist who befriends James Van Der Beek’s character and acts as his liaison to Taiwanese culture. Tiao’s measured and humanizing portrayal is reminiscent of Haing S. Ngor’s performance in The Killing Fields. We also see some young emerging Taiwanese American actors, Tonray Ho, Adam Wang, and Henry Chu in small but critical roles. With notoriously few roles available for Asian Americans in Hollywood, it is obvious that Will Tiao’s sense of community and his attempt to give voice and opportunity extends even to the creation of roles and casting. 9:35 pm. Credits roll. The applause lasts through the entirety of the credits. Certainly, this is the first time that most of the audience have seen their names and the names of people they know in the credits of a movie. This is not only the culmination of Will Tiao’s vision, but also of the faith and investment of the Taiwanese American community. The crowd rises for a standing ovation. The applause breaks only as some wipe away tears at hearing the familiar Taiwanese melody The Spring Breeze playing over the credits. We head out to the catered reception in the lobby to mingle with the cast and crew. Like those gatherings of yesteryear – picnics and dinners and lunar new year celebrations – the Taiwanese 1st generation connect with each other, greeting old friends and reveling in the afterglow of witnessing their story on the silver screen for the first time. Through the depiction of the young Taiwanese independence activists in the movie, one can envision the vibrance, the sacrifices, the hopes and dreams of these now-older 1st generation Taiwanese Americans. The project, as well as the film itself, signifies the merging of the generations, as 2nd generation Taiwanese Americans find a way to share the dreams of their parents’ generation. Will Tiao, like many other 2nd generation Taiwanese Americans, has found a balance between following his passions and keeping in mind the sacrifices of our parents’ generation. Through the years, we’ve followed Will Tiao’s progress. In a short, unheard-of three years, he has taken an idea for a film into the reality of a finished feature film. More amazing, he has managed all the key steps along the way – from fundraising, to casting, writing, acting and producing. And even as three years come to an end, this is only the beginning. The journey to share our story has just started. Who knows where we will be a year from now, but based on the ambition and abilities of Will Tiao and his team, we know some nice surprises must lie ahead. 11:10 pm. Nearing midnight, but the celebration is not close to over. Now, we’re off to the after-party at the famed Formosa Café on Formosa Ave to hang out with the stars. How appropriate. Ho Chie Tsai, the creator of TaiwaneseAmerican.org, vividly remembers growing up in the 1980s when his parents were blacklisted while actively supporting the Taiwanese independence movement. Shawna Yang Ryan, author of Water Ghosts, is at work on a novel about Taiwan during martial law. Anna Wu, an active supporter of Asian American art, is a photographer, the creative director of Mochi Magazine and a staff member of TaiwaneseAmerican.org.